Modern minds think of Leonardo da Vinci as a fully formed genius, in the same way they might imagine Mozart, Einstein, or Shakespeare. But this satisfying book upends that cozy claim. It takes a corrective look at Leonardo’s first 27 years during which he was snubbed, struggled, and departed Florence thwarted and penniless. Duke Ludovico Sforza’s reception in Milan was disappointingly tepid, and major commissions went to artists whose names are now forgotten. Long before he became court artist to Sforza (who initially ignored Leonardo for years) he struggled against the prevailing trends of Quattrocento style. That Leonardo himself had to pay for his first “commission” suggests that the monks who ordered it doubted his talent, or that the work would have never been realized had not the friar’s attorney, Ser Piero da Vinci, “lobbied strenuously on behalf” of the artist, his illegitimate son Leonardo. 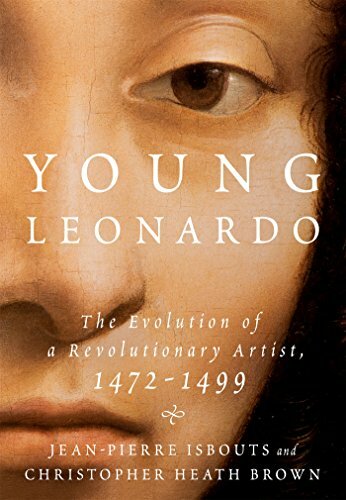 Young Leonardo’s authors make an unusual collaboration: Professor Isbouts is an established art historian and scholar of biblical archeology; Dr Brown is a maxillofacial surgeon “whose experience in cosmetically and functionally reconstructing the faces of his patients enables him to analyze Renaissance portraits from a fresh perspective.” Yet overtly there is little in the textual analysis to suggest the influence of a medical eye. The book is organized around specific early paintings starting with The Adoration of the Magi (1482, and never completed) and moving “toward” The Last Supper in Milan (1495–1498). Leonardo apprenticed in 1446 to Andrea del Verrocchio, who recognized him as a prodigy. Leonardo surpassed Verrocchio’s “somewhat soulless and formulaic figures,” painting instead three-dimensional shapes that were “suggested, rather than defined” by subtle glazes, delicate hues, and shading. He broke with the Byzantine tradition of ubiquitous lighting, boldly rendering figures instead in light and dark “chiaroscuro,” a technique which he may well have invented. And he introduced deep landscape vistas into the backgrounds. These are just some of Leonardo’s techniques that permanently transformed Western art. More than how a figure appeared, he cared how it functioned in a scene, knowledge gleaned from human dissection. He said that a painter must “be familiar with the anatomy of the tendons, bones, and muscles” in order to accurately render gesture or a pose. By this level of naturalism Leonardo captured the psychology of the sitter and the human face as a reflection of the soul. The authors provide a detailed analysis of the “cinematic movement” in The Last Supper in the long convent refectory of Santa Maria delle Grazie in Milan. Conventional linear perspective that previously focused on Christ at the center of this famous biblical moment failed to capture its dramatic tension. Spread out in a line, the Apostles have little to do in the narrative. Leonardo ignored the rules of linear perspective and placed his vanishing point 20 feet above the refectory floor so that the enormous fresco looked plausible and natural in depth no matter where one stood in the long but narrow refectory. It will be news to many readers that contemporaneous copies were made, possibly including one that King Louis XII of France commissioned directly from Leonardo and that may “still remain in existence today.” The authors call the evidence “compelling,” and offer side by side comparisons of photographic details from these copies and the original. Today we look on The Last Supper as a work of singular genius. But the authors contextualize it as a sacred object—commissioned by one of Milan’s most prestigious religious bodies—that had to adhere to established conventions. We are used to seeing “sacred paintings in carefully lit museums, in secular spaces that encourage us” to see them as pure art. But to illiterate viewers in the middle ages, “seeing an illusion of people in three-dimensional space on a flat wall . . . would have been a magical experience” imbued with spiritual reverence. Most books gloss over the fact that throughout the 15th century “the most important cultural endeavor in Milan was the construction of its cathedral.” The authors depict Leonardo’s years in Milan from a new perspective: that of the Sforza court. They show how Leonardo’s career was forcefully shaped by the politics and intrigue of the period, and how much of the Sforza patronage was directed on vast projects such as the Milan Cathedral that favored a close circle of local artists to which Leonardo never gained entry. As a result, the authors claim, his exceptional talent remained unrecognized by the wider world right up to The Last Supper. The authors also explore a mysterious link between The Last Supper and the giant fresco on the opposite wall, a Crucifixion with Donors by Giovanni Donato da Montorfano, a work that up to now public attention has largely overlooked.